The Dragons head to Saturday's regional final after a 43-35 victory. The Brunswick High girls’ basketball team took an early lead over York, then relied on defense Wednesday to advance to the Class A South final for the first time since 2010. Madeline Suhr had 19 points, six rebounds and three steals to lead the second-seeded Dragons to a 43-35 victory at Cross Insurance Arena. Messalonskee girls prep for Nokomis, while Messalonskee and Oceanside boys renew rivalry. ... The Eagles thrashed the Warriors in the regular season, 74-37 on Jan. 31. Still, Eagles coach Keith Derosby expects a closer game Friday. Nokomis coach Michelle Paradis said the strategy Friday is simple: Slow the pace of the game. ... Senior guard Sophie Holmes led a balanced Messalonskee attack with 17 points and eight rebounds and was given the Bob Whytock Award presented to the outstanding-player sportsman of the girls tournament. Eagles start strong to claim 1st regional title since 2009. ... In the first half, it was all Messalonskee. The Eagles made eight of their first 10 shots from the field, 11 of their first 16 and 15 of 28 by halftime, burying the Warriors 36-7 with transition baskets, points down low and precise shooting. That defense was as impressive as the offense, challenging shots, picking off passes and wrestling away steals to hold Nokomis to three first-half field goals and seven points. PORTLAND—It wasn’t the “Greely Invitational” after all. Saturday evening’s Class A South girls’ basketball final at the Cross Insurance Arena unfolded as a game to remember, but the for the top-ranked Rangers, it was a result to forget. While for the Dragons, it was history made. Madeline Suhr scores 22 points to lead the Dragons to the Class A South championship. Down 14 points early in the third period, Brunswick High dug in defensively and rode the all-around brilliance of Madeline Suhr to a stunning 54-51 upset of top-ranked Greely in the Class A South girls’ basketball championship game Saturday night at Cross Insurance Arena. Suhr scored 22 points, hitting all eight of her shots – including five 3-pointers – and grabbed 12 rebounds to lead the second-ranked Dragons to their first state-final appearance. Quinn, was there really 46 turnovers in the game and 1 player had 11 ? That seems way too high. 46 is indeed true.... 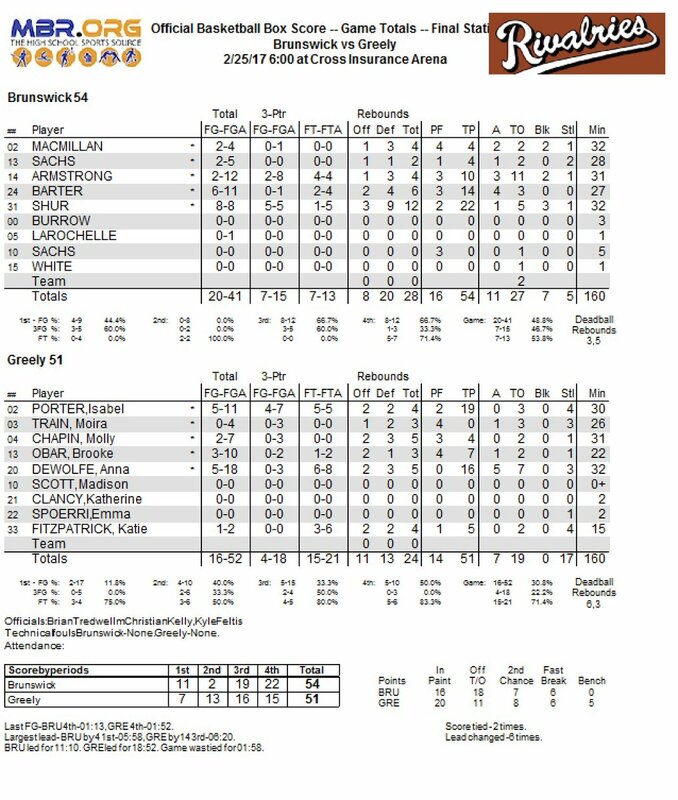 The game was back and fourth, and with some of the best ball handlers in the state on each team they took a lot of drives to the basket and made many crazy passes. But if that's what it takes to win, then I guess you should do what you have to! Patsfan07 wrote: Quinn, was there really 46 turnovers in the game and 1 player had 11 ? That seems way too high. I happened to be able to make the game. One player had 5 turnovers the first half and 6 the second half. That is a correct stat.